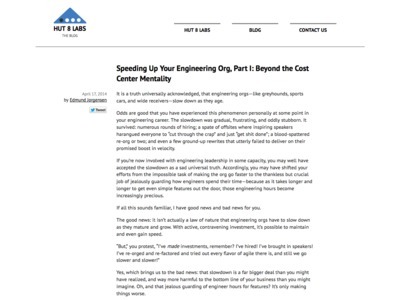 “You may have shifted your efforts from the impossible task of making the org go faster to the thankless but crucial job of jealously guarding how engineers spend their time—because as it takes longer and longer to get even simple features out the door, those engineering hours become increasingly precious. […] You've been around long enough to know that there won't be any "calm periods" when there's time for your engineers to scratch these other itches—after the Facebook for Cats integration goes out, you'll be right on to integrating with Twitter for Dogs, or LinkedIn for Ferrets. So on this fine morning someone has to make a real and uncomfortable decision: either tell Cindy and Scott to stop complaining and get back to feature work, or let product and the CEO know that you're going to spend some engineering hours on something other than features.